A family in Attleboro says the device they installed to keep their backyard safe has put their toddler in danger. The video they posted demonstrating it has since gone viral on social media. As temperatures soar, parents are beginning to think about pool safety, but a family in Attleboro, Massachusetts, said the gate that was supposed to stop children from getting into the pool didn't prevent their toddler from danger. The Wyman family recently purchased an above-ground pool and installed a ladder that includes a locked safety cover. Keith Wyman said the family was in their backyard last week when they noticed their 2-year-old son scaling the locked gate covering the ladder to their pool. 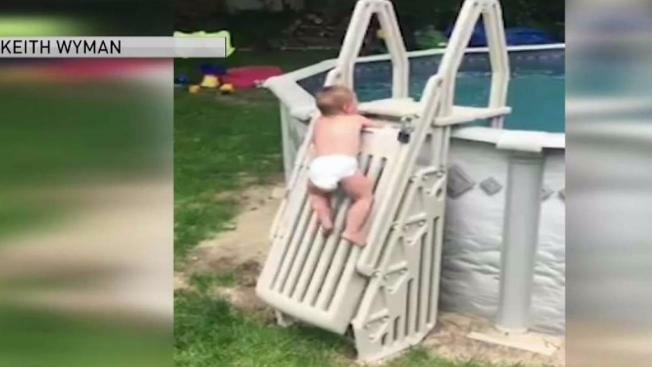 His mother grabbed him before he got into the pool, but not before capturing it on camera to show other parents how easily kids could climb over. The cover has slats in it, which the family said makes it easy for their toddler to gain a foothold and climb it. The Wymans said it sheds light on what they believe is a design flaw. "If a 2-year-old can do it, a 6-year-old can do it and an 8-year-old can do it," Wyman said. "The door on the ladder needs to be one solid piece if anything." Wyman posted the video of his son on Facebook on Friday. By Monday evening, it had been viewed nearly 20 million times and shared more than 530,000 times by people all over the world. Wyman said he has received comments from users as far away as Uganda and Australia. The pool store the family bought the ladder from offered to let them exchange it for a different model, but the family said many of the ladders have a similar design. The family said they've since learned that the ladder was manufactured by VinylWorks Canada. They tried to reach the company on Monday without success. NBC10 Boston spoke with a VinylWorks customer service representative Tuesday, who said the person who could comment on this was not in the office. The Consumer Product Safety Commission's Pool Safely guidelines call for the steps or ladder to be secured, locked, surrounded by a barrier or removed to prevent children from climbing up into an above-ground pool. The agency notes that spacing between horizontal slats or within decorative cutouts in gates and barriers should not exceed 1 3/4 inches. "This size is based on the foot width of a young child and is intended to reduce the potential for a child to gain a foothold and attempt to climb the fence," the CPSC guideline states. It was not immediately clear if the VinylWorks gate in the ladder the Wyman family purchased meets the spacing recommendations set forth by the CPSC. The Wyman family said it plans to install a fence around the pool to better protect it, but hope their video raises awareness. Hover over points of concern in the interactive graphic above to learn how to make your pool safer for your children.